Career Services has a variety of workshops available to both students and alumni through mySuccess. These workshops require advance registration on our mySuccess portal and are held on campus. Students are highly encouraged to attend all 5 sessions in the series, and by attending all workshops you can add this activity to your CCR! What to expect: A supportive environment in which you can ask questions, interact with your peers and learn about integrating into the Canadian workplace. 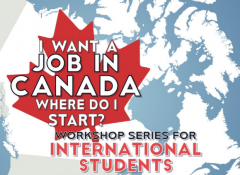 A Career Consultant will facilitate each workshop session and help to introduce you to Canadian hiring and workplace culture, as well as how to begin an effective job search. How to sign up: Register on mySuccess. Each of the five workshops in this series require individual registration. Please note: You don’t have to attend all five workshops, you can choose to only attend the workshops with topics that will be the most beneficial to you! However, if you do attend all five workshops in the series, you will be eligible to receive the Navigating the Canadian Workplace Acknowledgement on your CCR!